Python is a popular language capable of scripting as well as object-oriented programming. Several frameworks provide a GUI (graphical user interface) for Python, and most of them are good at something, whether it's simplicity, efficiency, or flexibility. Two of the most popular are wxPython and PyQt, but how do they compare? More importantly, which should you choose for your project? Let's tackle what most users notice first and foremost—what an application looks like. One of wxPython's unique feature is that its core libraries, written in C++, are wrappers around the native widgets of its host system. When you write code for a button widget in your GUI, you don't get something that looks like it belongs on another operating system, nor do you get a mere approximation. Rather, you get the same object as you do if you had coded with native tools. This is different from PyQt, which is based on the famous Qt toolkit. PyQt also is written in C++, but it does not use native widgets, and instead creates approximations of widgets depending on what OS it detects. It makes good approximations, and I've never had a user—even at an art school where users tend to be infamously pedantic about appearance—complain that an application didn't look and feel native. If you're using KDE, you have additional PyKDE libraries available to you to bridge the gap between raw PyQt and the appearance of your Plasma desktop on Linux and BSD, but that adds new dependencies. Both wxPython and PyQt support Linux, Windows, and Mac, so they're perfect for the famously cross-platform Python; however, don't let the term "cross-platform" fool you—you still must make platform-specific adjustments in your Python code. Your GUI toolkit can't adjust path formats to data directories, so you still have to exercise best practices within Python, using os.path.join and a few different exit methods, and so on. Your choice of GUI toolkit will not magically abstract from platform to platform. PyQt works hard to shield you from cross-platform differences. Allowing for the common adjustments that Python itself requires, PyQt insulates you from most cross-platform concerns so that your GUI code stays the same regardless of OS. There are always exceptions, but PyQt handles it remarkably well. This is a luxury you'll come to appreciate and admire. In wxPython, you may need to make a few platform-specific changes to your GUI code, depending on what you're programming. For instance, to prevent flickering of some elements on Microsoft Windows, the USE_BUFFERED_DC attribute must be set to True to double buffer the graphics. This isn't a default, even though it can be done unconditionally for all platforms, so it may have drawbacks in some use cases, but it's a good example of the allowances you must make for wxPython. As a developer, you probably don't mind the install steps required to get the libraries you need for your application; however, if you plan to distribute your application, then you need to consider the install process that your users must go through to get your application running. Installing Qt on any platform is as simple as installing any other application:. Give your users a link to download, tell them to install the downloaded package, and they're using your application in no time. This is true on all supported platforms. What's also true for all platforms, however, is that PyQt depends on the C++ code of Qt itself. That means that users not only have to install PyQt, but all of Qt. That's not a small package, and it's a lot of clicking and, potentially, stepping through install wizards. The Qt and PyQt teams make the installs as easy as they possibly can be, however, so although it might seem like a lot to ask a user, as long as you provide direct links, any user who can install a web browser or a game should be able to contend with a Qt install. If you're very dedicated, you could even script the installation as part of your own installer. On Linux, BSD, and the Ilumos family, the installs usuallyare already scripted for you by a distribution's package manager. The install process for wxPython is as simple on Linux and Windows, but it's problematic on the Mac OS. The downloadable packages are severely out of date, another victim of Apple's disinterest in backward compatibility. A bug ticket exists with a fix, but the packages haven't been updated, so chances are low that average users are going to find and implement the patch themselves. The solution right now is to package wxPython and distribute it to your Mac OS users yourself, or rely on an external package manager, (although when I last tested wxPython for Mac, even those install scripts failed). Both PyQt and wxPython have all the usual widgets you expect from a GUI toolkit, including buttons, check boxes, drop-down menus, and more. Both support drag-and-drop actions, tabbed interfaces, dialog boxes, and the creation of custom widgets. PyQt has the advantage of flexibility. You can rearrange, float, close, and restore Qt panels at runtime, giving every application a highly configurable usability-centric interface. Those features come built in as long as you're using the right widgets, and you don't have to reinvent fancy tricks to provide friendly features for your power users. WxPython has lots of great features, but it doesn't compare to PyQt in terms of flexibility and user control. On one hand, that means design and layout is easier on you as the developer. It doesn't take long, when developing on Qt, before you get requests from users for ways to keep track of custom layouts, or how to find a lost panel that got closed accidentally, and so on. For the same reason, wxPython is simpler for your users, since losing track of a panel that got accidentally closed is a lot harder when panels can't be closed in the first place. Ultimately, wxPython is, after all, just a front end for wxWidgets, so if you really needed a feature, you might be able to implement it in C++ and then utilize it in wxPython. Compared to PyQt, however, that's a tall order. A GUI application is made up of many smaller visual elements, usually called "widgets." For a GUI application to function smoothly, widgets must communicate with one another so that, for example, a pane that's meant to display an image knows which thumbnail the user has selected. Most GUI toolkits, wxPython included, deal with internal communications with "callbacks." 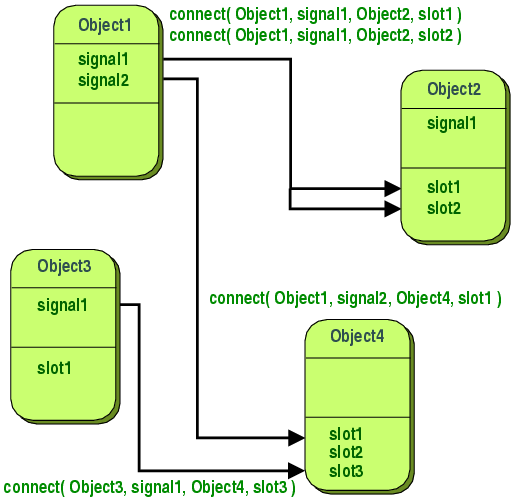 A callback is a pointer to some piece of code (a "function"). If you want to make something happen when, for example, a button widget is clicked, you write a function for the action you want to occur. Then, when the button is clicked, you call the function in your code and the action occurs. It works well enough, and as long as you couple it with lambdas, it's a pretty flexible solution. Sometimes, depending on how elaborate you want the communication to be, you do end up with a lot more code than you had expected, but it does work. Qt, on the other hand, is famous for its "signals and slots" mechanism. If you imagine wxPython's internal communications network as an old-style telephone switchboard, then imagine PyQt's communication as a mesh network. With signals and slots, everything gets a signature. A widget that emits a signal doesn't need to know what slot its message is destined for or even whether it's destined for any slot at all. As long as you connect a signal to a slot, the slot gets called with the signal's parameters when the signal is broadcast. Slots can be set to listen for any number of signals, and signals can be set to broadcast to any number of slots. You can even connect a signal to another signal to create a chain reaction of signals. You don't ever have to go back into your code to "wire" things together manually. Signals and slots can take any number of arguments of any type. You don't have to write the code to filter out the things you do or do not want under certain conditions. Better still, slots aren't just listeners; they're normal functions that can do useful things with or without a signal. Just as an object doesn't know whether anything is listening for its signal, a slot doesn't know whether it's listening for a signal. No block of code is ever reliant upon a connection existing; it just gets triggered at different times if there is a connection. Whether or not you understand signals and slots, once you use them and then try going back to traditional callbacks, you'll be hooked. When you program a GUI app, you have to design its layout so that all the widgets know where to appear in your application window. Like a web page, you might choose to design your application to be resized, or you might constrain it to a fixed size. In some ways, this is the GUI-est part of GUI programming. In Qt, everything is pretty logical. Widgets are sensibly named (QPushButton, QDial, QCheckbox, QLabel, and even QCalendarWidget) and are easy to invoke. The documentation is excellent, as long as you refer back to it frequently, and discovering cool features in it is easy. There are potential points of confusion, mostly in the base-level GUI elements. 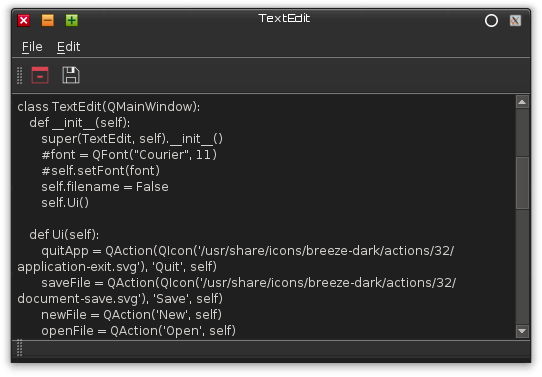 For instance, if you're writing an application, do you start with a QMainWindow or QWidget to form your parent window? Both can serve as a window for your application, so the answer is, as it so often is in computing: It depends. QWidget is a raw, empty container. It gets used by all other widgets, but that means it can also be used as-is to form the parent window into which you place more widgets. QMainWindow, like all other widgets, uses QWidget, but it adds lots of convenience features that most applications need, like a toolbar along the top, a status bar at the bottom, etc. The foundational widget in wxPython is the wx.Window. Everything in wxPython, whether it's an actual window or just a button, checkbox, or text label, is based upon the wx.Window class. If there were awards for the most erroneously named class, wx.Window would be overlooked because it's so badly named that no one would suspect it of being wrong. I've been told getting used to wx.Window not being a window takes years, and that must be true, because I make that mistake every time I use it. Place other widgets inside of a wx.Frame window, and then you're building a GUI application. For example, the wx.Panel widget is similar to a div in HTML with absolute size constraints, so you would use it to create panels within your main window (except it's not a window, it's a wx.Frame). WxPython has fewer convenience functions when compared to PyQt. For instance, copy and paste functionality is built right into PyQt, while it has to be coded by hand in wxPython (and is still partially subject to the platform it runs on). Some of these are handled graciously by a good desktop with built-in features, but for feature parity with a PyQt app, wxPython requires a little more manual work. Both the PyQt and wxPython GUI toolkits have their strengths. WxPython is mostly simple, and when it's not simple, it's intuitive to a Python programmer who's not afraid to hack a solution together. You don't find many instances of a "wxWidget way" into which you have to be indoctrinated. It's a toolkit with bits and bobs that you can use to throw together a GUI. If you're targeting a user space that you know already has GTK installed, then wxPython taps into that with minimal dependencies. As a bonus, it uses native widgets, so your applications ought to look no different than the applications that come preinstalled on your target computers. Don't take wxPython's claim of being cross-platform too much to heart, though. It sometimes has install issues on some platforms, and it hasn't got that many layers of abstraction to shield you from differences between platforms. PyQt is big, and will almost always require some installation of several dependencies (especially on non-Linux and non-BSD targets). Along with all that hefty code comes a lot of convenience. Qt does its best to shield you from differences in platforms; it provides you with a staggering number of prebuilt functions and widgets and abstractions. It's well supported, with plenty of companies relying on it as their foundational framework, and some of the most significant open source projects use and contribute to it. If you're just starting out, you should try a little of each to see which one appeals to you. If you're an experienced programmer, try one you haven't used yet, and see what you think. Both are open source, so you don't have to choose just one. The important thing to know is when to use which solution. Thanks for the article! I've been telling myself for years that I should learn a GUI framework, and PyQt (because I'm a KDE user) and wxPython (because "wx" is a common abbreviation for "weather") were two that stood out to me. I'm still flipping that coin, but this article was an awesome introduction to the strengths and weaknesses of the two. An absolutely essential question is left out: Python 3 support. wxPython has none at the moment, until its "Project Phoenix" rewrite nears production status. This rewrite has been underway since at least 2010 though, and while I am sure it is making progress the tempo just seems to be far too low for it to be a solid alternative for the future. Qt has its own share of issues on Python, but since PySide is now adopted by the Qt foundation as an official port, things should be looking up. Still waiting for Python >3.4 support and a Qt 5 port for PySide, though (see PySide 2). PyQt fills this hole in the meantime, but might be problematic license-wise (GPLv3 or paid commercial). All in all, native GUI support for Python is currently one of the weak points of its ecosystem. In practice the best way in my eyes is often to create a web interface to have a shot at simple platform interoperability, though it does not fit all tasks. I have made my living writing Python since several years and I think it is a fantastic language with an equally fantastic community, and I have high hopes for PySide 2. Good point. I use Python3 with PyQt without issue, but it could be a matter of complexity. PySide I kind of walked away from due to the lack of Qt5 support. Thanks for the nice and detailed article. However, IMHO you missed to mention a very important point: the difference in the license of the two frameworks. I could be wrong, but as far as I know for commercial Software development you will always need a rather expensive QT license, while you can use wxPython also in commercial products. 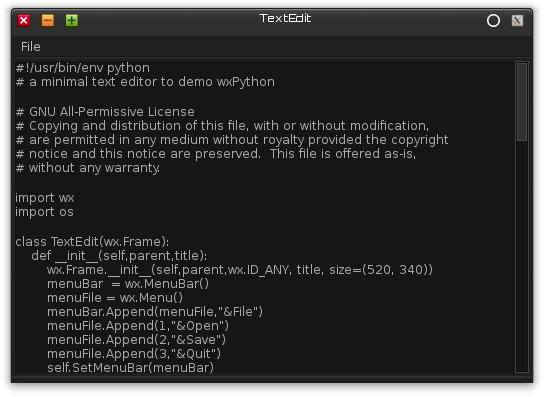 I am a big supporter of open source and FOSS Software, but in the long run wxPython could provide you an easy and cheap way to dual-license your software product. In contrast to that you will have to pay for the QT license and in principle you have to pay for it even before you decide on providing a commercial Version of your Software. Yes, you can use the GPL, but then you HAVE to use the GPL. Many folks don't want to completely open-source their code, and the wx license provides more flexibility. Note that LGPL is not GPL. Unless you have to modify the internals of Qt itself before distribution, you have no obligation to open up your code, and then only the modifications to the LGPL parts (i.e. Qt) -- not the entire application. As an example, I know that StarCraft 2 includes LGPL licensed libraries (LZMA, ImageLib -- listed in the credits) even though it is most certainly a closed-source commercial application. There might be something said about the "Tivoization clause" of LGPL v3, but that should not apply in the context Python is generally used (if you are affected by this, you probably already know it). While that may not apply in the case discussed here (since it is about using Qt via Python, i.e. more indirectly), one should note that (AFAIK) when going the proprietary way, even when using the "less strict" LGPL rather than a full GPL, the same license violation (put differently: software *user* rights violation) may occur: once linking LGPL code into a proprietary component via static linking (as opposed to dynamic! ), there is a license violation as well, just like with using plainly GPL licensed components. My understanding of this was that the Qt libraries themselves are licenced under LGPL, so you can use them without re-licencing your own project. However, the PyQt Python module is only available under the GPL licence. This created a weird situation where you can use Qt, but if you want to use it from Python you'd need to release under GPL or buy a commercial licence. This is where PySide comes in, which provides bindings to Qt for Python but under the LGPL licence. The only problems are lack of support for Qt 5 which I think was started but I'm not sure if there is a stable release. CurrentFile.close() is redundant in your PyQt5 example. 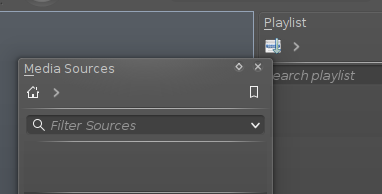 The "with" context manager closes the resource automatically. Thank you for this article! Currently I am developing an app and I'm torn between choosing whether to use wx or qt. This article helped my decide with my selection. I'm glad it helped. I was just updating an application I wrote in Python 2.7 with PyQt4 to the latest Python 3 + PyQt5, and I have to say that the porting process was as simple as I could have hoped. I've not yet gone through that with a WxPython app, although it's on the horizon. Hopefully it will be similarly breezy.